Food historian Paula Marcoux likes fire. She enjoys a good bonfire as much as the next person but admits that she always wonders ‘what could I cook over it?’ Smoke is a preservative of food, flavor and in the eyes of Paula, a way to look at local culinary history. Paula Marcoux’s specialty is cooking over fire. My curiosity is cooking over smoke. I asked her if she thought smoke was a flavor, a process, both, or something else entirely… She sees smoke with a historical lens. 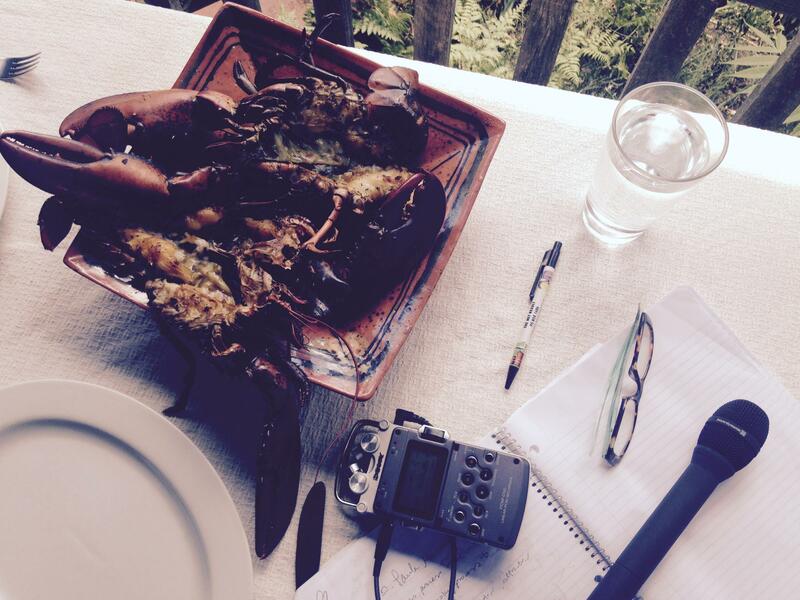 Our conversation happened over a charcoal-fired lunch at her place - an experiment in smoking lobsters…split…. “They’re like a pound and a quarter, I’d say. This is the part I hate. Sorry guy. They have hard shells today. Paula explained to me that smoke is made out of all the elements in wood that are NOT carbon. The things that burn off the wood and create flavor. I suddenly looked at a burning piece of wood in a totally different way. The smoke coming off it being the volatile compounds and water that brings that smoky flavor to the lobster. Something that ordinary charcoal cannot do. And that’s why when you’re trying to smoke food over charcoal, you need wood chips. “I’m going to rearrange my fire because it’s a bit too high. In fact I’m going to put some wet wood on there. I have birch because birch says Northwestern Europe and Northeastern United States to me. The very tastiest to my modern sensibilities you know, of fire cooked food involves a set up where it’s actually spitting fats and juices onto the coals and that searing, that burning, is causing sort of a doubling back of the flavor. If anything, a little bit of miso butter might be really good with the smoky, flavor that I hope it’s going to get. Just a little bit…I really made like a half tablespoon of butter, and half tablespoon of miso, and maybe a half tablespoon of sake, and ah, just anointing them gently with it. At this point this I’m completely mesmerized by the fire, the summer day, the tradition, the process, and Paula’s way of seeing cooking. “And now we’ll slow the fire down, and actually create a little bit more smoke. That’s the one thing, the one bad thing about it being too hot – not just that it’s cooking it too quickly but that it’s not creating smoke. I’ve got it damped down so it has very little oxygen in there and I’m actually going to pour a little water in there. And the lobster, with or without that ash, was sublime. Paula has a cookbook recently published: Cooking with Fire. Experimental is the operative word here. At Paula’s we found that the claw meat from one lobster was underdone while the other was perfect. Not sure why. No matter, we took the underdone claw meat and swirled it in the skillet that had the residual butter-miso-sake mix. It was delicious. Try it yourself! Preheat the smoker to hot. 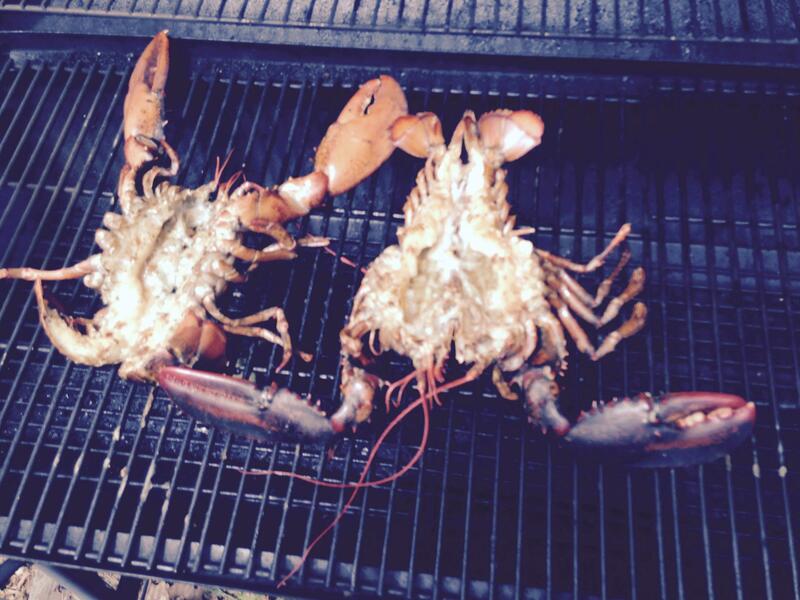 Place the lobsters shell-side down on the smoker so you can watch the progress of the meat as it cooks. 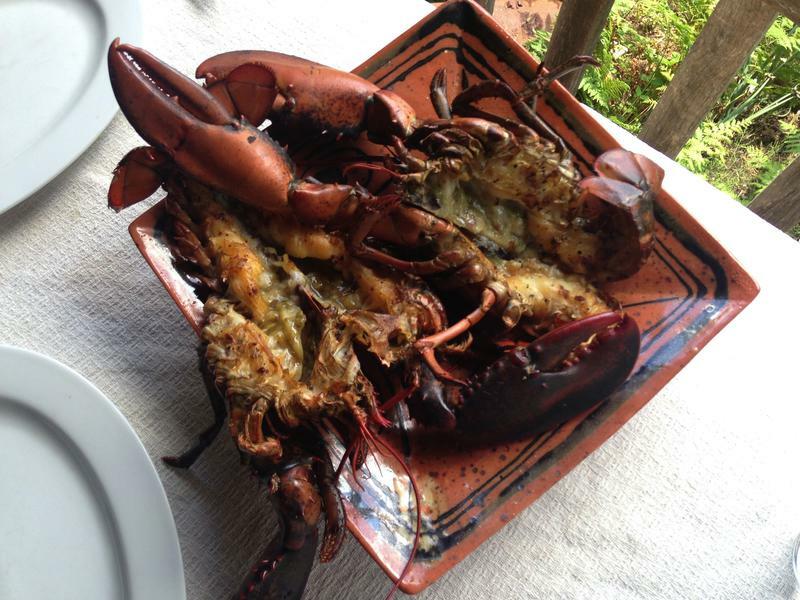 Anoint the lobsters with the miso-butter. Close the smoker…. peek…close the smoker till you poke the meat it’s cooked through. Estimated time: 45 minutes. Serves two.